Acknowledging inspiration when it arrives, and acting on it, is incredibly useful. That’s what I did yesterday. I went out to stretch my legs and get some fresh air, and luckily my camera was slung around my neck. It’s true, I could have processed the next batch of photos from last year’s epic journey to the West Coast and back; but instead of discussing the past, I’d like to share with you something beautiful (and often taken for granted) that’s happening all over the North American Midwest right now. You see, it’s raining very, very slowly right now, even as you read this. But there’s something strange about this rain. This rain won’t get you wet, and it lasts for days and days every year. The rain that falls now isn’t a rain of water, it is a rain of leaves. As I was walking back, I noticed a leaf fall beside me, and the still voice within me told me to halt. And so I completely stopped. I looked under a maple and waited. After a minute or so, I saw a leaf fall. Then another. After spending some time to stop and really take in my surroundings, I realized that roughly once or twice per minute, one or two maple leaves would make an infinitely small crackling noise, and then fall slowly to the ground. The trees themselves were raining. I began to listen, and in my listening I started to realize what old monks mean when they say that contemplating nature itself is a meditation. It’s been over 3 years since I’ve photographed the autumn colors here in Wisconsin. I was lucky this year because I found a place (as you can see above) that had a very even bed of bright orange leaves. To say this yard was completely untouched may be an understatement, but I’ll give the house’s owner the benefit of the doubt since they were probably on vacation. And the way that the sunlight streamed through those golden leaves from above was something of the Essence of Autumn here in Wisconsin. 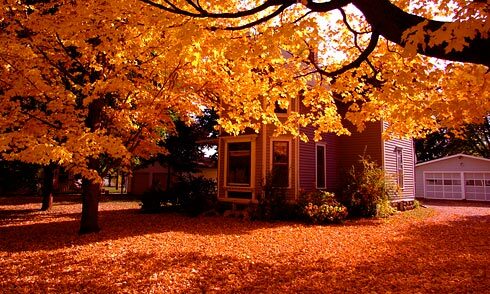 I find that the best autumn colors occur in Humid Continental climates like that of Wisconsin (and no, that doesn’t mean it’s always humid); and if you have never experienced an autumn in a Continental climate, I highly recommend it. No other autumn comes close. And only by consciously choosing to stop, take a breath, and be really aware of what was happening around me, was I able to appreciate it. But there’s also a lesson behind the lesson of today. Just because creating something is beautiful and sacred, doesn’t mean it has to be difficult. In fact, when you act on inspiration, it feels easy. Photos from this walk work well as a desktop wallpaper or for just sharing with friends. 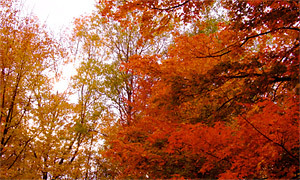 They’re in the An Orange Wisconsin Autumn album. All photos in Photos can be used as desktop wallpapers because they are high resolution (1920×1440).